MICHIGAN'S MOST DYNAMATIC, ENERGETIC & REQUESTED AUCTIONEER! Multiple Auction Industry Award Winning and Two-Time Championship Finalist, Kenny Lindsay and his World Class benefit auction team delivers a powerful and high energy performance like no other auction team in the United States. From small high school benefits to nationally recognized galas such as Make-A-Wish Foundation, the Kenny Lindsay Fundraising Auctioneers team will empower your organization and electrify your audience! "The value of a true benefit auctioneer is discovered the weeks and months prior to the actual event. This is accomplished during the consultation period which enables your auctioneer to become an integral part of the planning committee. This process educates your committee, builds rapport and empowers your organization. Simply hiring a "bid caller" for the night of the event is short changing your bottom line." Copyright ©2016 Kenny Lindsay Fundraising Auctioneers. All rights reserved. 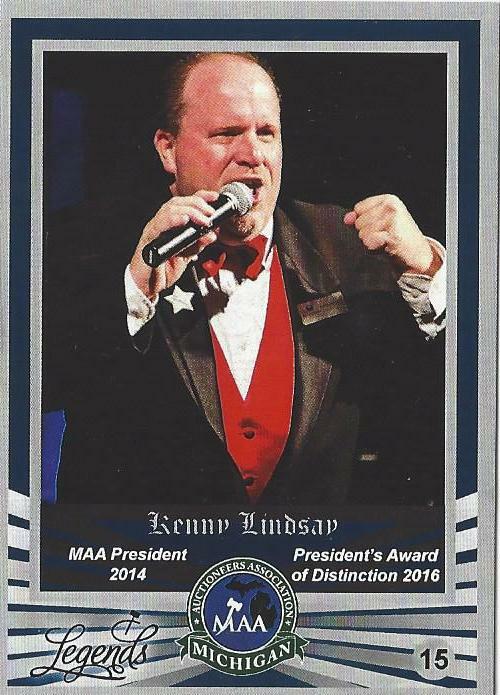 Professional Auctioneer, Kenny Lindsay was selected as 1 of 37 auctioneers featured in the MAA 'Legends' Series 1 Trading Cards.